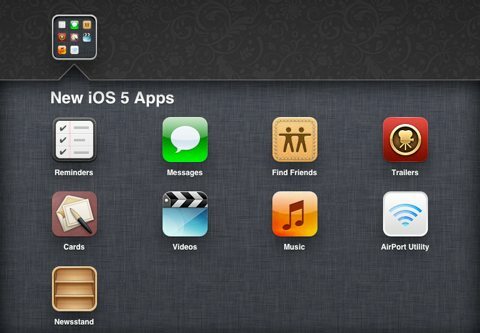 With the introduction of the new iOS 5 operating system last week, Apple has enhanced and added apps, as well as integrated iCloud into many of these apps. We’ve reviewed nine of these iPhone, iPod Touch, and iPad apps. Overall, in iOS 5, we noticed an improvement in graphic quality and clarity, as well as an enhancement of download speed. An arrow at the top of the screen also lets you know when an app is accessing your location. Some of these new and enhanced apps may require some adjustments in your settings menu, so you will want to take the time to make the features function in iOS 5 in a way that improves your experience with your iPhone, iPod Touch, and iPad. The iOS 5 Reminders for iPhone, iPod Touch, and iPad includes excellent features like location-based notifications, an easily accessible search mechanism, iCloud back-up, and iCloud calendar integration. The iOS 5 Reminders app has simple, logical navigation, so you are able to add lists and items with just a few swipes and touches on the screen. The ease of navigation does not, however, limit the opportunity to add pertinent details and reminders. The keypad pops up for detailed notes, and the calendar feature pops up for reminders. One of the most useful features is the ability to set a reminder for a specific location. So, if you are at work and want to remind yourself to do something at home that evening, you set 6PM and your choose your contact address. I tested it yesterday, and it worked smoothly. Since Reminders run in iCloud, you can also access all of the same features on all your Apple devices, as well as your Mac or PC. This iOS 5 app brings more to the table than comparable to-do list iPhone and iPad apps for the unbeatable price of free. The improved iOS 5 iMessage app for iPhone, iPod Touch, and iPad allows users to send messages and content via wi-fi to other iOS 5 devices and avoid SMS fees. Yes, iPad and iPod touch users can finally send and receive text messages from iPhone users. The app icon itself is still labeled as “Messages” but now in the Settings section you will the new iOS to iOS feature referenced as “iMessage”. You can distinguish Wi-Fi messages by their blue color, instead of the green of SMS messages. The iOS 5 iMessage app functions similarly in look and feel to the previous version; however alerts now include the familiar iMessage gravatar on the left side of the notification center screen. You’ll find this feature particularly helpful when you go through your notifications after you have been holed up in a conference room for two hours. iMessage also integrates with Find my Friends for iPad, iPod Touch, or iPhone to send messages to attendees of a temporary event. The Find My Friends iOS 5 iPhone, iPod Touch, and iPad app uses iCloud & integrates iMessage and Facebook-like and Twitter-like qualities to help you keep track of your friends and family who use iOS 5 devices. Friends ask and agree to follow one another, and, when accepted, you can easily iMessage, FaceTime, or email from the app. If you’re the first to arrive, you can quickly verify that your wingman is en route and hasn’t bailed on you. The Find My Friends iOS 5 app also allows users to set up temporary events, so a group can be formed for a specific event and time to coordinate communication. It makes those cumbersome twenty people birthday party cocktail and dinner extravaganzas more bearable logistically. As with any iPhone, iPod Touch, or iPad app that shares your location, you need to be very careful and discriminating about your selection of followers. Overall, a great new app that to complements the Find My iPhone feature well. The iTunes Movie Trailers iOS 5 app for iPhone, iPod Touch, and iPad delivers video previews, reviews, release dates, movie theaters, and show times for new and upcoming movies, as well as previews, reviews and purchase options for iTunes movies. You scroll through featured movies on the front page of the app or navigate with a touch to Top 25 lists. The video quality is incredible, and downloads are extremely quick. You can choose to add movies to your favorites, check the calendar for release dates, and search for movies at your local theater. The movie theater locator allows you to check the locations on a map. The iOS 5 iTunes Movie Trailers app also provides a week’s worth of times for movies. It is a must-have for movie lovers and guys reluctant to pull the trigger on a first date movie. He can pull out his iPhone at dinner and ask his date to select. Watch out Hallmark! The iOS 5 Cards iPhone, iPod Touch, and iPad app makes it easy for you to design and send an old-school postcard via snail mail. You choose between different themes like Thanks, Holidays, Birth announcements, Birthday, Love, and Travel. Then, you choose the designs that will be letter-pressed by hand, upload pictures, add custom text, and address the envelope. With one tap, you can pull up your iPhone and iPad contacts to get the correct address. The cost is calculated for domestic, as well as international addresses. Sales tax is calculated for all billing addresses in the U.S. The card I created was $2.99 plus sales tax. That’s still less expensive and takes less time than going to the card shop. And, the cards are attractive, interesting, and customizable. Currently, the iOS 5 Cards app accepts payments via Visa, MasterCard, and American Express only. A great upgrade would be an opportunity to process via an iTunes account and redeem iTunes gift cards directly from the Cards iPhone, iPod Touch, and iPad app. The iOS 5 update breaks what used to be the iPod app into two different apps — one for music and books and the other for videos. For better or worse you now have 2 app icons instead of one. The Music app contains your iTunes music library, books, and podcasts. It can get confusing if you have video podcasts, because they are now in the Videos app. You navigate through the iOS 5 Music app for iPhone and iPad in basically the same way as in previous operating systems. You click the store button at the top of the screen to quickly access the iTunes store where you can redeem iTunes gift cards or pay via iTunes account. The iOS 5 Videos App for iPhone, iPod Touch, and iPad lists your videos by genre. You click to play the video, and the quality and sound has a nuanced improvement. When you download new videos on wi-fi in iOS 5, the faster speed is truly visible and pronounced. The downloads in 3G continue to lag, but there is improvement in iOS 5. You can click the Store buttom at the top of the screen to quickly access the iTunes store as well. The iOS 5 iTunes Movie Trailer app is prominently featured in the store, so the integration of iOS 5 applications continues within the iOS 5 Videos app as well. AirPort Utility is a new universal app for iOS devices that let’s you fully manage your AiPort Express, Airport Extreme, and Time Capsule network devices from the iPhone, iPod touch, or iPad. Once you open the app it shows a map of the network in your home, using icons for the various Airport devices. Tap on any device to start viewing its current settings like IP Address and a list of connected wireless clients. Tap edit and you can then start editing pretty much all of the settings once you enter the device password. You can do things like restart your routers, change Wi-Fi passwords, change security modes, and even advances settings like DHCP, NAT, Disk Sharing, File Sharing, and Radio Channels. Another great feature is the ability to view error messages right from your iPhone. You do have to be in your home and connected to your Wi-Fi network to use the Airport Utility app. One important missing feature is the ability to log out of a device once you’ve logged into it. Overall Airport Utility is a very valuable app for anyone using Apple’s Airport devices. The iOS 5 Newsstand app is an opportunity to group monthly and yearly subscription iPhone, iPod Touch, and iPad apps for newspapers and magazines in one place. For example, New York Times now runs through Newsstand. The downloads are super quick on Wi-Fi and swiftly enough on 3G, but, overall, definitely faster than previous operating systems. The newspaper and magazine apps do not operate in any dramatically different fashion than the apps pre-iOS 5. The main difference is the newspapers and magazines are updated every morning, and you receive a notification on your screen when complete. You access the Newsstand store with one touch and pay via iTunes payment accounts. The Newsstand iPhone, iPod Touch, and iPad app also includes the great feature to redeem iTunes giftcards and promo codes directly from the Newsstand store. Quick Tip: One thing you’ll notice is that you can’t place the Newsstand app in a folder. There is an easy trick to do this if you have quick hands and here’s how it works. Tap and hold so you get into the jiggle mode. Drag any 2 apps on top of each other, which puts them into a folder. As soon as you do this grab the Newsstand app and drop it into the new folder. You have only about 1 second to do this and if you do it fast, the app will sit in that new folder nicely! AppSafari review of 9 New iOS 5 Apps for iPhone iPad and iPod touch from Apple was written by Jenni Ward on October 20th, 2011 and categorized under App List, Productivity, Utilities. Page viewed 5230 times, 4 so far today. Need help on using these apps? Please read the Help Page.